I know people have to kill each other, but come on! The off-duty police officer shooting his brother-in-law over a WATER GUN is a bit much, even for you. And this quote, from the victim’s cousin, after the incident: "If you're going to shoot someone over a water gun, you could have shot him in the arm or the leg, you didn't have to shoot him in the chest." …I guess that’s true. Is that the great lesson here? A little crazy. And this – at your baseball game? Really, Philadelphia? Would it be crazy to think that the Police Officer used a one liner as he tasered the kid? I’m no good at this. What do you think he said? Sorry, I’m straying here. …At least you took care of those flash mobs! Thank God the incident over the weekend wasn’t one of them! It was only a few hundred kids this time on your north side – phew! And they didn’t hurt that many people – it’s all in proportions, Philly. Can I call you Philly? Oh. Sorry. What else…what else…oh! I do like your weather, for the most part. That’s a good thing, it was a little, you know, crazy, for a while, but I think you got it down now. A little humid but – oh never mind, you’re fine. You’re fine. So, in summary, shooting over a water gun – bad. 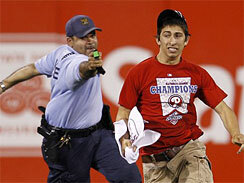 Tasering the kid at the baseball game – a little crazy (but kind of funny too, you got me there). Good job on taking care of the flash mobs and good job on the weather. See? It’s not all bad – Philly – Philadelphia. I don’t like being so negative. I just want to make sure that you won’t keep being so…well, you know.